Cate comes home with a “Friday Folder” each week from school and we carefully go through it, and she shows me her work and we talk about what they did and what they are going to learn the upcoming week. She told me about their “sight words” as they learn to read, “he” and “for.” They are learning the letter Bb next week and show and tell is Monday, they need to bring an item that starts with that letter. They will also be tackling the teen numbers, healthy habits, and parts of trees in science. Every week is a whole new mountain of information for her to take in. As we moved through her folder we came to a worksheet on patterns. They were supposed to listen to directions and using pumpkins they had already cut out, color and paste the rows of pumpkins. The first row of brown pumpkins is colored carefully, mostly inside the lines, and with deliberation. The second green row is colored carefully as well. 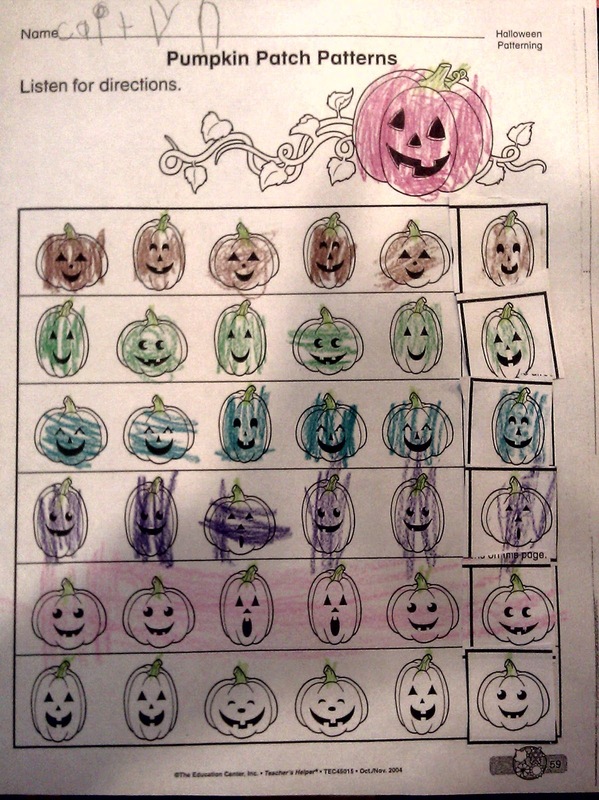 The third row of blue pumpkins starts to get less “inside the lines.” By the fourth row, the purple crayon seems to have traveled roughly across the images and the entire fifth pink row of pumpkins is colored in, paying no attention to the lines at all. The final row is blank. “We didn’t have time,” she explained.